Eask Tower, an old signal tower, is located on the summit of Carhoo Hill. Ballymacadoyle Hill is a lower height further west. Carhoo Hill is the 1415th highest place in Ireland. Carhoo Hill is the most easterly summit in the Dingle West area. From many parts of Dingle and the surrounding area the Eask Tower on top of Carhoo Hill is very visible. If you attempt to go up by the obvious route you will be confronted by this demand for payment for access. 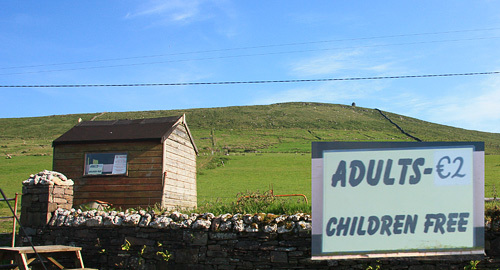 The sign printed in red beside the charge says that you will be on a farm and the occupier of the farm excludes the duty of care towards visitors. But they'll take your money nevertheless. Ireland of the Unwelcomes.